More than five years ago, at midnight in a dim alley behind the George R. Brown Convention Center in Houston, Texas, a black van pulls up to the curb. A man in a leather jacket and dark sunglasses jumps out and grabs a stack of large cardboard boxes sitting at the loading dock. His partners inconspicuously help him pack the heavy loot into the trunk. “Well, I’ll tell them we’re just a bunch of librotraficantes (illegal book traffickers) out here,” he replies, laughing. He opens up the box and runs his fingers along the spines: Like Water for Chocolate, The Devil’s Highway, Curandera, House on Mango Street. The full name of the man making jokes is Tony Diaz, a Houston-based writer and professor, who took his first literary risk in 1998. Despite being told “Latinos don’t read,” he started Nuestra Palabra: Latino Writers Having Their Say, a nonprofit that hosted its first literary event in a Mexican restaurant in Houston. Six years later it hosted 30,000 people at the third Edward James Olmos Latino Book and Family Festival, creating the largest book event ever held in Houston — the 4th most populous city in the United States. Unfortunately this mega-book fair came to an end after the 2008 recession. That’s when the organization focused on smaller book signings, poetry readings, and workshops. April 22, 1998 — Nuestra Palabra: Latino Writers Having Their Say, founded by Tony Diaz, holds its first literary showcase in the party hall of Chapultepec Restaurant, Houston, TX. 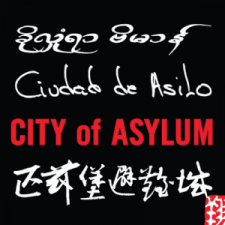 The group’s mission is to promote Latino literature and literacy. March 20, 2001 — First broadcast of Nuestra Palabra: Latino Writers Having Their Say ON THE AIR, on 90.1 FM, KPFT, Houston, Texas. October 16-17, 2004 — 30,000 people attend the Houston Latino Book and Family Festival at the George R. Brown Convention Center, organized by Nuestra Palabra. However, it was at one of the mega book fairs, celebrated from 2002 to 2008, that Diaz met multimedia journalist Liana Lopez. He asked her to be in charge of managing the events’ author readings, band performances, and panel discussions. The book fairs were large and exciting, but after the day was done, Diaz, Lopez, and the Nuestra Palabra volunteers took on the less glamorous work of loading packages of books into vans. That’s when they were joking about being book traffickers. At the time Diaz also hosted a weekly radio show for Nuestra Palabra on 90.1 FM KPFT-Houston. He invited Lopez to join him on the air along with his co-producer, Bryan Parras, an activist and journalist. For years, Parras had been working with the US Social Forum, a bus caravan that goes from Oklahoma to Detroit to present a multitude of social justice platforms. Eventually Lopez joined Parras on the caravan and helped find places for the activists to sleep and eat along the way. When political pundits proposed building a wall along the US-Mexican border, the group reacted with a spoof. They started calling themselves “Mexican Minutemen,” and demanded secure borders between the US and Canada. They sent out press releases, made posters, and organized a protest in front of the Canadian consulate. What they never imagined was that in 2012 they would be boxing up books that were banned in Tucson, like Like Water for Chocolate, The Devil’s Highway, Curandera, and House on Mango Street. This time, they wouldn’t be taking the books to a literary event. Instead, the books would become part of a network of underground libraries in cities from Houston, Texas to Tucson, Arizona. The Mexican-American Studies program of the Tucson Unified School District (TUSD) was unique. Its alternative approach to learning taught American history through the lens of Chicano and Latino literature. Books such as Richard Delgado’s Critical Race Theory and other material usually not taught until a college or graduate level were part of the curriculum. Students enrolled in the program boasted a 93% graduation rate – almost twice as high as the national average for Latino students. However, the program came under fire from Arizona lawmakers. In May 2010, Arizona Attorney General Tom Horne introduced HB 2281, calling for the elimination of ethnic studies courses that “promote the overthrow of the US government, promote resentment toward a race or class of people [and] are designed primarily for pupils of a particular ethnic group.” A year later, TUSD requested an independent audit of its Mexican-American studies program. The audit found the program to be in compliance with the law. Yet the school district did not find the audit to be enough proof. On January 6, 2012, Superintendent John Huppenthal announced that the district would lose $15 million in funding if it did not comply with HB 2281 and remove its Mexican-American studies program. Four days later, the TUSD school board voted to suspend the program and ordered that all books and materials associated with the curriculum be removed from classrooms. Officially, administrators announced seven books that were to be taken from classrooms during the school day, boxed up, and put into the EZE Box secure storage. Books like Paulo Freire’s Pedagogy of the Oppressed and Richard Delgado’s Critical Race Theory were “confiscated.” However, with the elimination of the program, over fifty books in the curriculum (listed here) became off limits to teachers and students. This included titles from Latino and Chicano writers such as Sandra Cisneros, Junot Díaz, and Carmen Tafolla. Even the texts of non-Latino writers, such as Shakespeare, Thoreau, and Howard Zinn, could not be taught or referenced in the context of race or Mexican-American history. 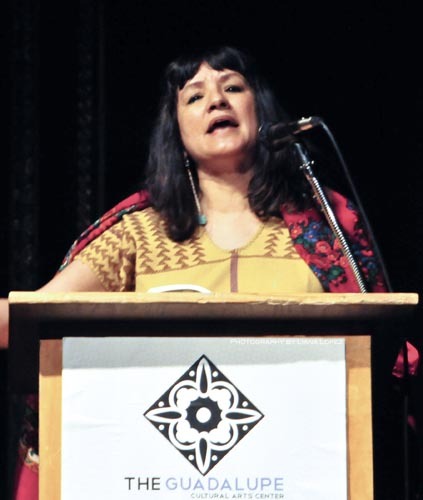 Sandra Cisneros (author of 'House on Mango Street') at the Banned Book Bash at the Guadalupe Cultural Arts Center. She was the first to give the Librotraficantes a generous donation to support the caravan to Tucson. Tony Diaz points out the irony of this statement: “The students are American students. [Mexican-American studies] is the history of America.” Another irony is that, so far, TSUD has not stopped teaching European history. A day after the ban went into effect a federal judge ruled that students were permitted to sue the state and challenge the constitutionality of the law. History teacher Lorenzo López and his daughter, sophomore Korina López, are plaintiffs in a lawsuit against the state, arguing that HB 2281 violates their First Amendment rights. Within a week the books that were once the core of a rigorous curriculum became invisible. Students were eager for a change but held little power against the system. But over 900 miles away, in Houston, their cries for help were heard. 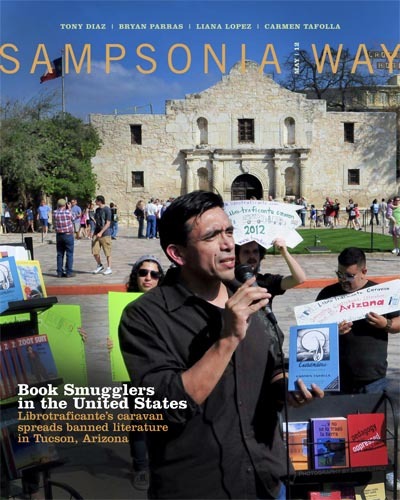 9 Comments on "Book Smugglers in the United States"
Great article! I love to see artists struggling for social justice. But I think it’s a mistake to couch this simply in the terms of censorship and freedom of speech. The Arizona government destroyed this Mexican-American studies programme because they felt the programme was potentially insurrectionarry. It taught people things they shouldn’t know, and it helped an oppressed race rise up. This threatens the US power structure. This is not an issue of artists saying whatever they wish in the geography of liberal-ideological social discourse. We ought to acknowledge that capitalism and its brothers racism and sexism practice a form of social censorship before one can even graduate high school, let alone become a published (marketable) writer. To speak solely in terms of censorship versus freedom of speech (a negative freedom) is to elide the greater issue, that of positive freedom. The freedom TO DO something. Most chicanos, most blacks, and so many women of any colour do not have the freedom to publish their works. Here is a socially imposed silence, not from the government, but from the entire system of the United States; everyone imposes this silence. It is a violent silence, a painful silence. These freedom fighters in SW America are fighting to break this silence, so let’s not contribute to the censorship by eliding the larger social issues at play. Liam, I totaly agree with you, this silance must be broken. To blame is the entire system of the United States. So very sad, it has gone on much to long. Many thanks to the young Mexican- American studies students from Arizona that decided to stand up for their Rights for all our Rights. 1. Buy a banned book. 3. Discuss it with friends and neighbors. 4. 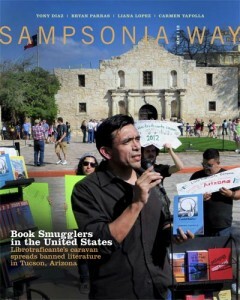 Donate it to a librotraficantes library. 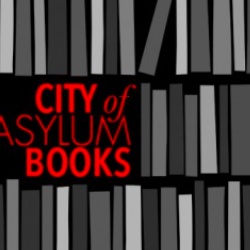 So, please, visit the blog and banned bookstore, buy a book, read the book, discuss it, and ship it to a community library (addresses of librotraficante community libraries included). Thanks for this great article. I am compiling a list of banned books from your list and other lists and going to make sure my library buys these books and has them in a separate and prominent shelf.